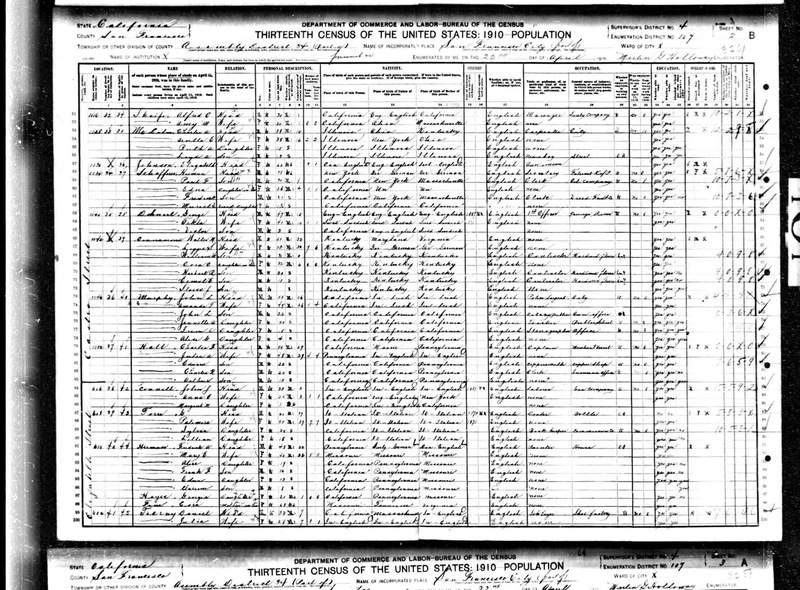 Genea-Musings: Treasure Chest Tuesday - 1910 U.S. Census Record for Herman Schaffner Household in San Francisco, Calif.
Treasure Chest Tuesday - 1910 U.S. Census Record for Herman Schaffner Household in San Francisco, Calif.
1910 United States Federal Census, San Francisco County, California, population schedule, 34th Assembly District, Enumeration District 107, Page 2B, Dwelling #34, Family #37, Herman Schaffner household, online database and digital image, Ancestry.com (http://www.ancestry.com); citing National Archives Microfilm Publication T624, Roll 98. Herman Schaffner is the head of household, with son Paul, Paul's wife and daughter, and Paul's brother in the household. Mary Ann (Paul) Schaffner, the wife of Herman, died in 1908 in San Francisco. 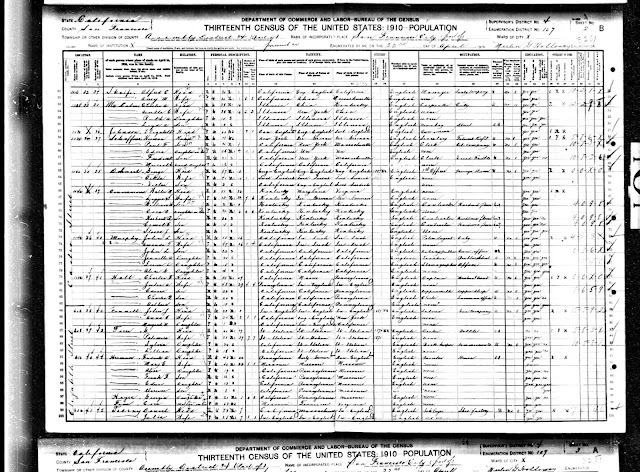 Herman and Mary Ann (Paul) Schaffner are my wife's great-grandparents, and their eldest son, Paul Schaffner (1878-1934), who married Edna McKnew in 1906, are my wife's maternal grandparents, through their daughter Edna who was born in 1913.